When it comes to deciding what to feed your dog, it’s easy to get caught up in trends and the latest craze that’s sweeping the doggy-nutrition world. All too often we hear claims of various foods and supplements – some old, some new – being able to cure all manner of aliments, of being a superfood with powers previously unknown. It’s understandable that someone would want to get involved with this latest trend, to make sure they’re giving their dog the best thing for them. Unfortunately, but perhaps unsurprisingly, all too often these claims are too good to be true. For one thing, there’s no such thing as a superfood! It’s simply a marketing ploy to get people to buy certain foods. And for another your dog’s body and health is much too complex for any one food or product to be able to fix and maintain it all. So, what’s the latest trend people are feeding their dog? And what – if any – are the harms and benefits of it? Despite the concept being around for many years, bone broth has had a resurgence in popularity in recent years, particularly among the canine community. It’s made by adding bones to water and cooking the mixture at a low temperature for a long time – anywhere between 6 and 72 hours depending on who you ask and the bone type being used. Typically, bone broth made from beef and pork bones tends to need to cook for longer than if made from chicken bones. A mild acid of some sort, most commonly apple cider vinegar or lemon, is added to water-bone mixture to draw out the nutrients and minerals from the bones. Other herbs and supplements, such as garlic, kelp or nettles can also be mixed with the broth, but are removed before serving by sieving the mixture. The resultant mixture is bone broth, and its supporters claim it can do everything from boosting your dog’s immune system and detoxing their liver, to building bones and helping with collagen development. But can it really do all, or any of these things? Is bone broth full of nutrients? One of the biggest benefits of bone broth that people claim is that it’s packed full of nutrients and is a great way of making sure your dog is getting what they need. The theory goes that by adding an acid to the cooking process, it ‘leeches’ the nutrients (namely calcium, magnesium and phosphorus) out of the bones and into the resulting broth. The first obvious place to start when looking for the nutrient content of bone broth is the USDA National Nutrient Database, ‘soup, stock, beef, home-prepared‘. As you can see from the analysis the levels of minerals in bone broth is rather unimpressive and would contribute little to your dogs overall diet. For instance, 100ml of homemade beef broth provides approximately 8mg calcium, 7mg magnesium, 31mg phosphorus, 2g protein and 13 calories. The recommended daily requirements for a 10kg healthy adult dog are, 731mg calcium, 111mg magnesium, 562mg phosphorus, 18g protein and approximately 500 calories. For comparison’s sake, 1 large egg (50g) provides approximately 25mg calcium, 5mg magnesium, 86mg phosphorus, 6g protein and 78 calories. Of course the nutrient content will vary depending on the kind and amount of bones, the length of time it simmers and other ingredients, but to claim that bone broth is a nutritional powerhouse is probably a bit of an overstatement. Can bone broth help your dog recover after surgery or during illness? Dogs who don’t have much appetite due to illness or are recovering from surgery often needs calorie-dense foods. Because of the nutrition content claims, bone broth is often recommended as one of the very best foods you can feed a healing dog. But as we have just learned, bone broth provides minimal calories and only a modest amount of nutrients so it’s not the best choice under these conditions. Instead, a pureed soup made with vegetables and low fat, high-protein ingredients like chicken or egg can provide more vital calories and nutrients. Can bone broth detox your dog’s liver? Another bold claim often made around bone broth is that it can detox your dogs liver. This is not true. The liver is not a storage organ for toxins. One of the main roles of the liver is to detox – to filter blood, metabolise drugs and break down chemicals. So, if your dog’s liver needs to be detoxified it means there’s something seriously wrong with it, and your dog’s health. Something that certainly won’t be fixable by feeding them bone broth. Does bone broth aid joint problems like arthritis? 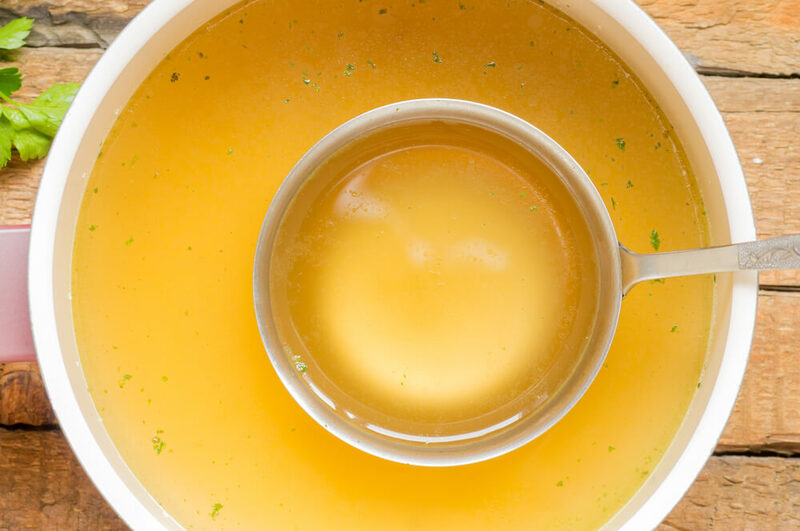 While the nutrient content of bone broth is variable and questionable, there’s evidence to suggest that it’s a good source of protein. Specifically, of the protein collagen. Arthritis is a result of the loss of collagen, which cushions joints so it would make sense to suggest that increasing dietary collagen can be beneficial to arthritic dogs. And that it can help stave off the development of joint problems in the future. The problem is that dietary collagen isn’t absorbed whole and sent straight into your dog’s knees, hips, or other joints. Like other proteins, collagen is broken down into amino acids. The body then distributes and uses those amino acids where they are most needed. Does all of this mean I shouldn’t give my dog bone broth? While the evidence presented above makes it sound like you shouldn’t include bone broth in your dog’s diet, this isn’t necessarily the case. Rather, it’s intended to inform you that if it sounds like something is too good to be true, that it can have a variety of disparate benefits, then it probably is. In this case, the claims made around the benefits of bone broth to your dog’s health aren’t backed up by credible evidence. Nonetheless, this doesn’t necessarily make bone broth a harmful thing to include in your dog’s diet. Think of it as something to include every now and again for a bit of variety, or to add to dry food to help its consumption. In short, it’s like most things in life and in your dog’s diet – it can play a part and contribute to your dog’s overall health in a positive way, but how it does this will vary for every dog, as will the quantity of it to include. And it’s certainly not a fix-all cure or remedy for various aliments – few things ever really are. If you like this blog please share with your friends by using the super easy share buttons below. This entry was posted in Blog and tagged arthritis, Bone broth, detox, dog health, dog nutrition, dogs, liver.